The Sustainable Development Goals cannot be achieved without affordable and universal access to ICTs and broadband connectivity, according to members of the Broadband Commission who met on 18 September for the annual Commission meeting, held on the eve of the opening of the 71st session of the UN General Assembly. The Commission addressed two specific challenges during this year’s meeting: firstly, how broadband can support the equitable provision of health and education in all countries and secondly, how to achieve the investment levels required for the rollout of global broadband infrastructure that connects everyone, everywhere. The deployment of broadband plays a critical role in achieving the Sustainable Development Goals (SDGs). According to the latest estimates, 59 million children are out of school, and 38 million people die annually from non-communicable diseases – broadband can reduce these dramatic numbers by making education and lifelong learning, as well as public healthcare, more available, accessible and, potentially, equitable. Carlos Slim, Chairman and Chief Executive of telecommunications companies Telmex and América Móvil, President of the Carlos Slim Foundation and Co-Chair of the Broadband Commission, said, “In the knowledge society, the equal participation of all is necessary, in particular the equal participation of women,” he said. Referencing a major new ITU and UN Women initiative which will be known as EQUALS, Slim said: “This is why I support EQUALS.” EQUALS will be launched on 20 September. Following Dr. Nabarro’s remarks, Scott Gegenheimer, Group Chief Executive of Zain Group, an innovative mobile operator across the Middle East and Africa, and Kevin Martin, Facebook’s Vice President of Mobile and Global Access Policy, both of whom are Broadband Commissioners, announced an exciting collaboration with the United Nations High Commissioner for Refugees (UNHCR) to provide free, open and high-speed Wi-Fi internet connectivity to refugees in the Kingdom of Jordan for five years. The connectivity project backed by Zain Group, UNHCR and Facebook will offer unlimited, 24/7 outdoor and indoor Wi-Fi access points through Zain Jordan’s high-speed 4G mobile network. In total, there are now 91 economies where over 50% of the population is online, up from 79 in 2015, the report says. The Broadband Commission for Sustainable Development was established in 2010 and comprises more than 50 leaders from across a range of government and industry sectors who are committed to actively assisting countries, UN experts and NGO teams to fully leverage the huge potential of information and communication technologies (ICTs) to drive national SDG strategies in key areas like education, healthcare and environmental management. 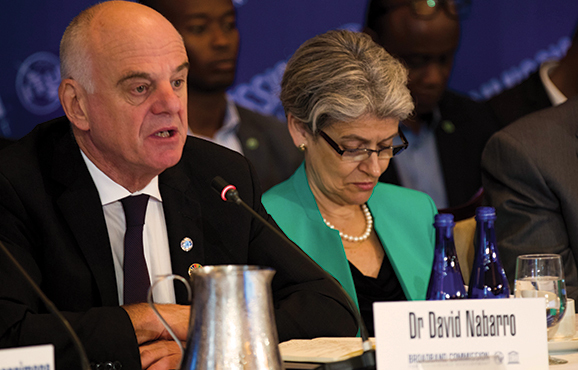 1 Ban-Ki Moon’s address to the Broadband Commission were personally delivered by his Special Advisor, Dr. David Nabarro, on behalf of the Secretary General.